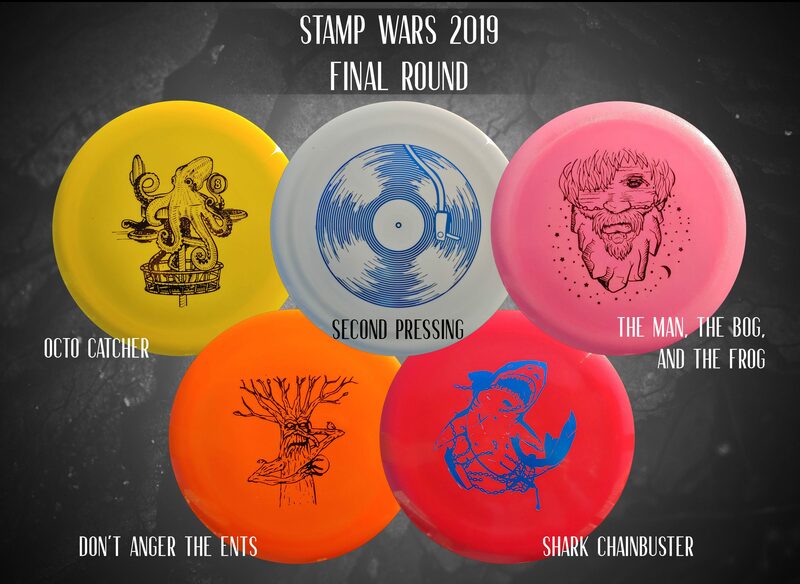 The final round of STAMP WARS 2019 has begun. For the final round, we took the top 5 stamp designs from the voting rounds and had them stamped on popular disc models from Innova, Trilogy, and Discraft! So, the first place winner will be decided through sales. Whichever stamp sells the most in the next month (or reaches such low stock levels that we’re almost out) will be the all-around winner for this year. That will be the stamp that is put on more discs during the 2019 season. So, if you are a fan of any of these stamps, you can now buy them for your own collection! Here is where to find each one. Thanks to all of the participants who submitted stamp designs and thanks to all of those who voted and made the contest a lot of fun. Now let the battle begin! Red foil would also look good. Maybe the tone arm could be a different color. Buying some Octos and Sharks right away! All of them are great stamps! How is the Shark stamp not on a Shark? Shark is available on the Mako3!